There is neither provenance nor dates available for the Dargate book. 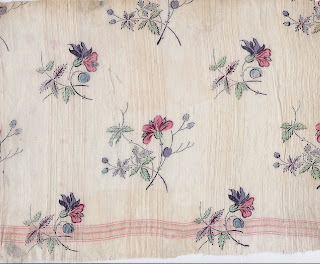 It was given a circa 1830 (+ or - 5 years) designation by two textile historians. One suggested it most likely was from Alsace, a major textile printing area in France. I just came across an interesting date in the book, The Fabrics of Mulhouse and Alsace, 1801-1850. In Mulhouse, the firm of Nicolas Koechlin & Freres developed woven muslin with satin bands for printing in 1829. This was followed the next year with the printing of flower motifs on 'organdie with woven squares'. This is a scan of a sample from the Dargate Book of an organdy (sheer crisp cotton used for dresses and curtains) with woven stripes plus a delicate horizontal band in pink which was printed with floral sprigs. Depending on your browser, you should be able to zoom in on this picture to get a closer look at the woven stripes. Often 19 th century purples are referred to as' fugitive'. 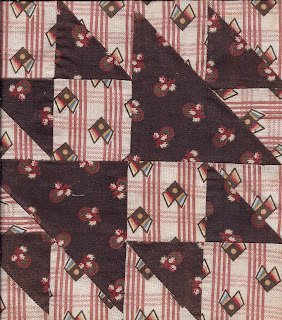 When you look at a quilt, a garment or a length of cloth, what was once a lovely purple could now be a soft shade of brown. Early 19th century cotton purples would have been dyed with a number of natural dye sources; logwood, seashells or most often madder. 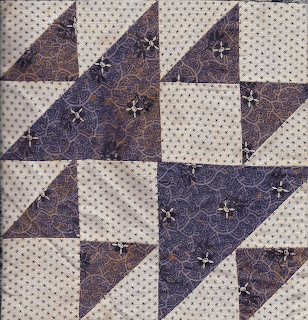 The first synthetic dye, Perkins Purple 1856, worked best on wool and silk. 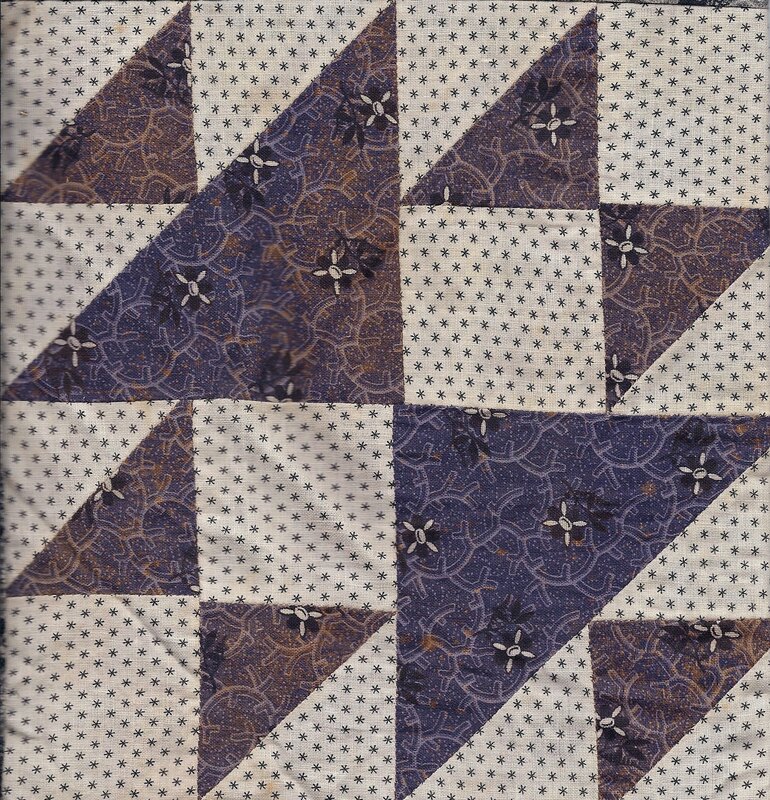 A chemical purple dye was available in 1862 but many of the fabrics printed at that time have reacted to both sunlight and humidity, changing to brown. I recently had the wonderful ! 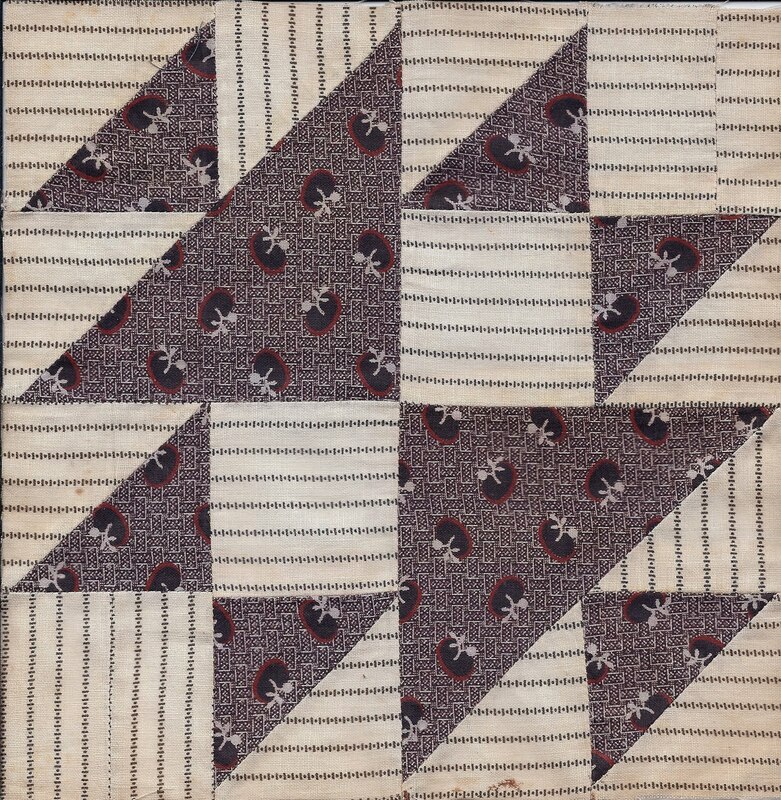 opportunity of studying a large group of quilt blocks from the upper Ohio Valley, 1880-1910. Here is one of these blocks. The print is changing from a fairly vibrant purple to that often seen soft brown. You may, depending on your browser, be able to put your cursor on this block and zoom in on the purple print. I am lecturing on quilts of the late 19th century next Saturday, April 10, 2010, at the conference, Prairie Points and Backstitches, at the Musuem of the Rockies in Bozeman, MT and showing 135 slides, including this one, to illustrate my talk. If you are interested in attending, please call me at 406-580-3358.